There’s been a thread I started to notice. Jeffrey talked about designing fast and slow: to do, and to learn. Jen talked about what it means to be ‘of the web’ but not to be limited by it. Pacing came through again in Jeremy’s talk, again related to what should be fast or slow. Aaron brought up the idea of friction created by poor performance: again, pace. That thread began to take shape in my mind in the form of words. Words and the web. On the web. Of the web. But still ultimately human. I spent most of a decade dedicating every day to racing a bicycle. Not for the betterment of humanity or the advancement of human peace. But because it felt good. What I feel when I ride is inseparable from and intimately tied to the act itself. To force one’s body to it’s limits is not possible as a purely physical act. Without the capacity to mentally override the shutdown switch, we’re inherently limited. Without that capacity to will ourselves to do more, we’d have no heroes. No Shakespeares. None of the amazing women who have graced this stage, enduring so much more to get here than I could understand. In this case, that present is about 500 years ago. Been thinking a lot about the evolution of design and typography. Not just recently on the web, but over decades. Centuries. Like this book of psalms. And this one might say it in the most genuine way yet. There’s a hand in this. A human one. With feelings. This truly is the winter of our discontent We have to remember that design systems are the plateau, not the pinnacle. Let’s head into the foothills. Width font-stretch: 265; font-variation-settings: ' wdth' 265; font-stretch: 402; font-variation-settings: ' wdth' 402; ' wdth ' Featuring Output Sans by DJR, Louvette by CJ Dunn, & Amstelvar & Decovar by David Berlow & Type Network Width can come in handy for both larger scale headlines like the WSJ in print and also for data-dense use cases like scores, or on smaller screens to improve line wrap. https://www.mozilla.org/en-US/firefox/channel/desktop/#nightly JUST IN: Victoria sent me a sneak peek at what she and the rest of the Firefox team are working on for release this summer! So readability and finesse are pretty good, no? Let’s set this solid. But ick. OH! We can fix that. Let’s go further. What about editorial hierarchy on media sites? I tried to find a list of news headlines in Facebook. I couldn’t. But we keep pushing for our content to travel. And that’s generally absent many or all of those all-important signifiers. Here we have Apple News headlines. Sorta branded, but not really effectively. And The New Yorker is… spot on. And no ads. Just a small cost per article (but that’s a whole other conference full of conversation) But maybe this is how our content should travel. With it’s voice. We really can elevate design for the web We can pass the plateau, and reach the pinnacle. 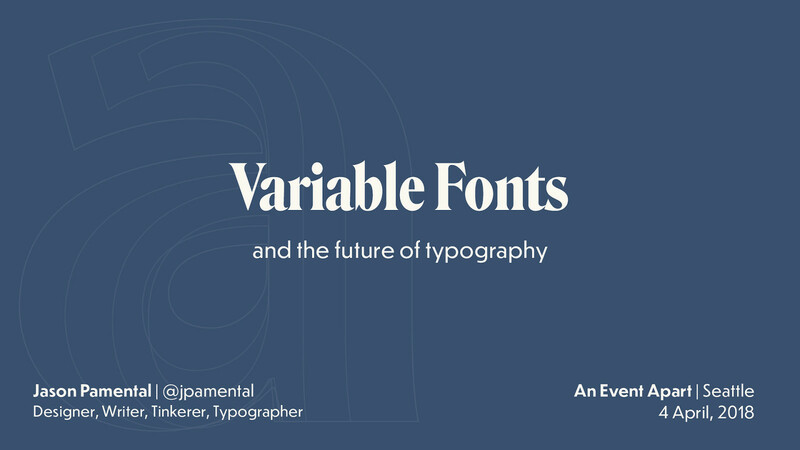 View Variable Fonts and Our New Typography on Notist. That’s about the clearest idea I’ve heard about how to choose a font. What should these words, this content, sound like? Choose a typeface that makes it sound like that.